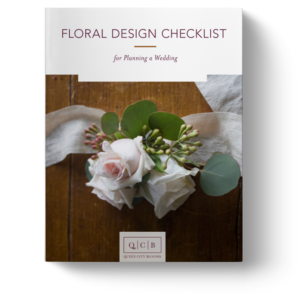 In March we had the honor of creating the most wonderfully colorful florals for an amazing couple. 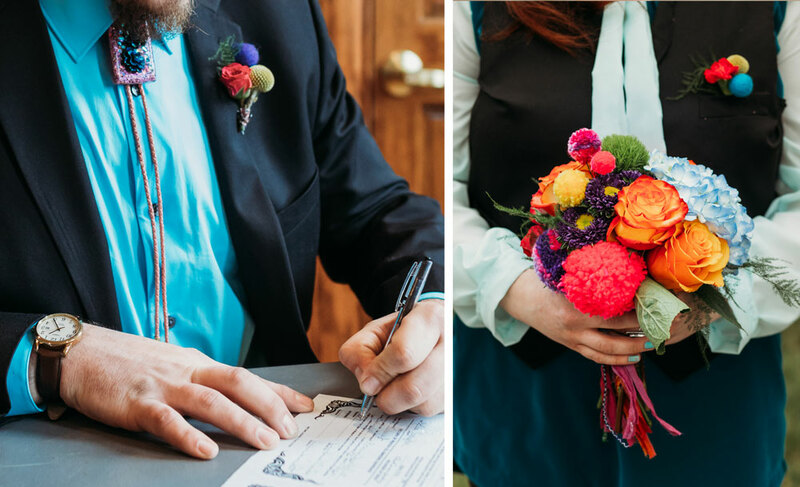 Not only did their bouquets and centerpieces include a vibrant selection of flowers, but also… wait for it… handmade pompons. Pompons?! Yes. And we. are. into it. Handmade poms on anything and everything, please! Whitney’s bridal bouquet included blue hydrangea, green ball dianthus, hot pink and yellow roses, mums, and delphinium. Not to mention, of course, the incredible pompons handmade by the bride herself. 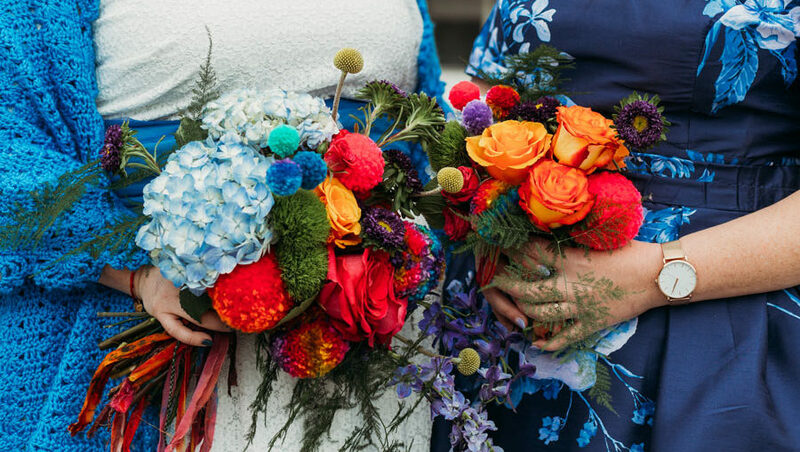 The bridesmaid bouquets included many of the same elements, infusing the cheerful colors throughout every element of their wedding day. Even the bouquet ties were carefully chosen by the bride! 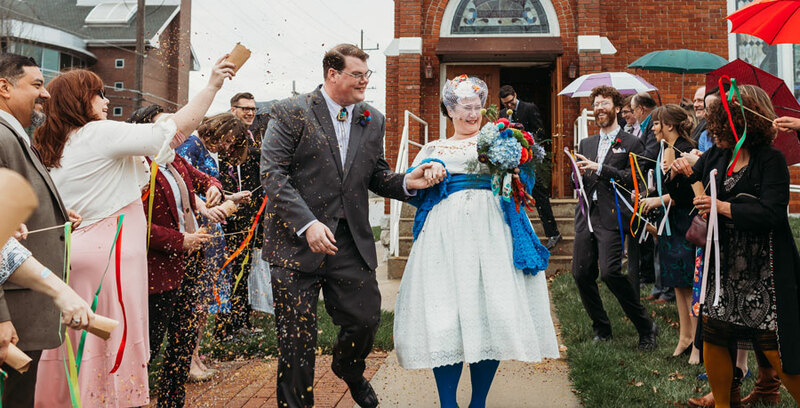 She collected two different types of handmaid ribbon for some additional flair and artistic romanticism. The wedding party wore shades of teal, jazzed up with bouquets, corsages, and boutonnières in every color of the rainbow. We cannot get enough of the awesome bolo ties the men wore. Just when you thought this wedding couldn’t get any more fun, we go and show you these quirky centerpieces. 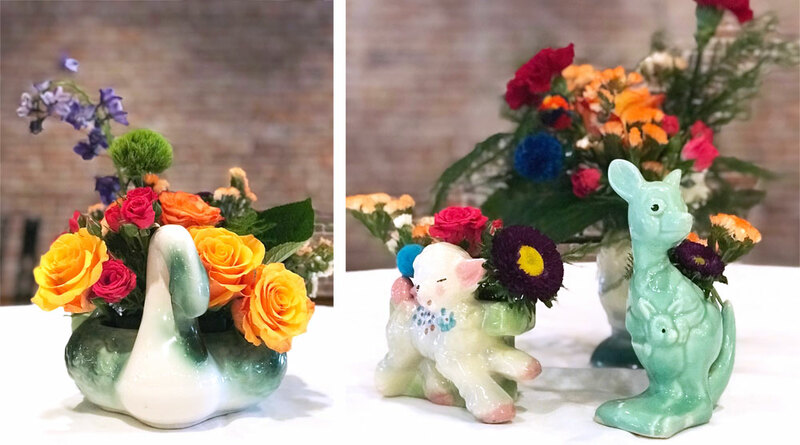 Whitney collects vintage planters, and delivered boxes of planters to our doorstep so we could create these whimsical designs. We had the best time sorting through her treasures, creating arrangement after arrangement with these adorable creatures. We even took a little video of the amazing array of planters. And we couldn’t help but share this final photo of the happy couple. Whitney and Garrett, you two were a dream to work with and we wish your family the absolute best.